Good morning, since I am getting ready to start a project for a friend's dinning room I wanted to do a post about them. 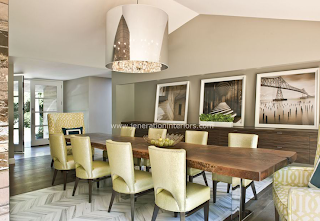 For those of us who are lucky enough to have a separate dinning room space it is really a chance to entertain and it needs to be done right. Sound daunting? Not really, follow these general guidelines and you can make yourself a beautiful dinning room that you can be proud of. 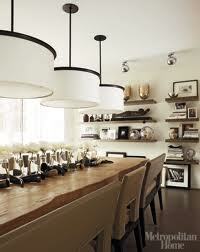 1) Every great dinning room will have feature lighting. For most that is in the form of a great chandelier light fixture. That is a very broad term and doesn't just mean a crystal light so think outside the box on this one. 2) Choose your table style. Remember that you can completely mix things around on this one. Do you want a round table or a rectangle, or possibly an oval table? How many people do you need to be able to seat? How large is your room? What style do you want (rustic, modern, traditional)? These are all questions that you will run in to. 3) Choose your chairs. Rarely will I ever buy a room with all pieces together. I will find random things from everywhere and put them together which is really what will give a room interest. With chairs you should look at the number you need, then the style you want. If you went with a rustic table maybe you should choose elegant upholstered chairs or slip covered ones. 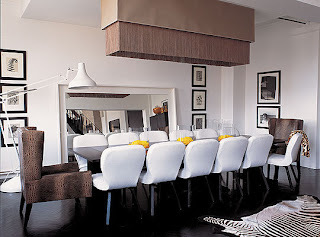 If you go with modern chairs then maybe your ends can be something completely different like an animal skin (or faux). Perhaps you want the informality of a bench at your table? Make a choice based on what you like and what works for you. 4) Choose your window treatments wisely. Does your room need privacy? Is there too much light pouring in that needs to be filtered? Do you want flowing curtains to adorn your windows and bring in the elegance you need? Do you just want two simple panels to flank the windows that can be opened and closed at ease? This is really a way to add another layer to your room. For me I have white walls with really high flowing white curtains that just add a feminine touch to my very rustic masculine table. It can also be a fun way to choose a fabric and have a local seamstress sew them for less than you think which is a very designer touch. What ever you choose just make sure to not skimp on the details since guests will certainly be in this room. 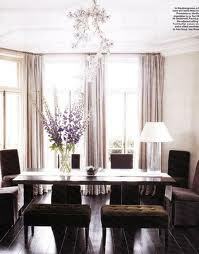 5) Decide if you want a rug in your dinning room....or not. It can either be a way to add another layer or it can be something that throws an open floor plan off. I have opted for no rug, for now. But there are so many amazing options.Just make sure it is a large enough size and you would typically want one that your entire table can fit on, or one that is simply for decoration such as an animal hide. 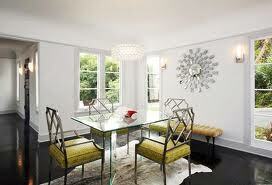 Keep in mind that it is a dinning room so there could be food and spills. 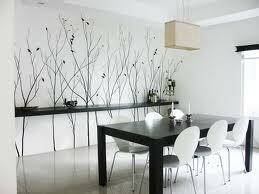 6) Decide what you will put on your walls if you have them. Will it be a star burst mirror or a floor mirror? Will it be a series of art or photography? Will it be a large canvas or large art piece? This is a big element and will be seen by all so choose wisely. 7) Choose a buffet or display console if you have space. Will yours be a built in or stand alone style? Will it be wood, or will it have mirrors and other elements? Will it be rustic or polished and sleek? There are so many choices that can bring another element to your dinning room. They work well for storage, displaying your lovely treasures, and most of all give you a place to set your champagne bucket for your dinner parties:) Mine serves as a bar and as a place that I put my candles. If you have the space it is worth the investment. 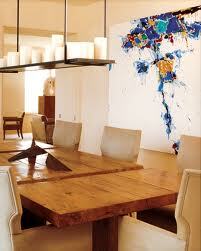 8) What will you display in your dinning room? This seems to be the toughest question that I get asked. My suggestions are to keep it natural and never use fake flowers. Ok so maybe that's just me, but you do what you like. I recommend displaying things in a group of 3 especially on your table (or more if you can). Things that I have done are candles in hurricanes with sand in the base. "Fish" bowels with sand and real coral in them. Round large vases with moss. Round vases with drift wood in them. Basically I favor natural elements when possible. A large piece of drift wood down the center of your table is a great eye catching piece. And always use candles, they cast such a lovely glow and are universally flattering. As a rule of thumb, switch your table scape with your dinner parties and always try to display real flowers or fruits and veggies when possible. It adds such detailed a touch for your guests. 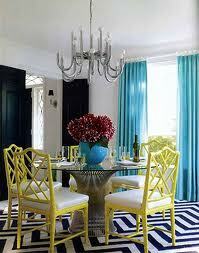 Turquoise curtains and zig zag carpet,..the colour of chairs.. mmmmmmm.. just gorgeous! Hi Amaradi, aren't they fabulous?! Thanks for stopping by. Hi Jazz, thanks and I'm glad to see you are following. Would love to have you link a picture of your dinning room once it's finished so that we can see your beautiful results.